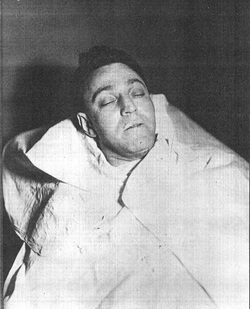 Schultz's body is taken to the morgue shortly after his death. Statements made by Arthur (Dutch Schultz) Flegenheimer were taken down by a Newark police stenographer, F. J. Lang. The notes covered a period from about 4 p.m. Thursday, Oct. 24, until Schultz died later that night. During that period he was delirious most of the time, but had lucid intervals. At the time the notes begin, Schultz was irrational, suffering with a fever of 106 degrees and a bullet in his stomach. Sergeant Luke Conlon and other detectives from Newark police headquarters were at his bedside. One of the officers was holding a newspaper. (Schultz noticed newspaper and spoke) - Has it been in any other papers? George, don't make no full moves. What have you done with him? Oh, mama, mama, mama. Oh stop it, stop it; eh, oh, oh. Sure, sure, mama. You get ahead with the dot dash system didn't I speak that time last night. Whose number is that in your pocket book, Phi1 13780. Who was it? Oh- please, please. Reserve decision. Police, police, Henry and Frankie. Oh, oh, dog biscuits and when he is happy he doesn't get happy please, please to do this. Then Henry, Henry, Frankie you didn't even meet me. The glove will fit what I say oh, Kayiyi, oh Kayiyi. Sure who cares when you are through? How do you know this? How do you know this? Well, then oh, Cocoa know thinks he is a grandpa again. He is jumping around. No Hobo and Poboe I think he means the same thing. Q. (from Sergeant Conlon) - Who shot you? A.- Yes, I don't know. A.- Will you help me up? O.K. I won't be such a big creep. Oh, mama. I can't go through with it, please. Oh, and then he clips me; come on. Cut that out, we don't owe a nickel; hold it; instead, hold it against him; I am a pretty good pretzler -Winifred- Department of Justice. I even got it from the department. Sir, please stop it. Say listen the last night! (Statement by Sergeant Conlon) - Don't holler. A.- I don't want to holler. A.- I don't know, sir. Honestly I don't. I don't even know who was with me, honestly. I was in the toilet and when I reached the -the boy came at me. A.- No. If he wanted to break the ring no, please I get a month. They did it. Come on. (A name, not clear) cut me off and says you are not to be the beneficiary of this will. Is that right? I will be checked and double-checked and please pull for me. Will you pull? How many good ones and how many bad ones? Please I had nothing with him he was a cowboy in one of the seven days a week fight. No business; no hangout; no friends; nothing; just what you pick up and what you need. I don't know who shot me. Don't put anyone near this check~ you might have -please do it for me. Let me get up. heh? In the olden days they waited and they waited. Please give me a shot. It is from the factory. Sure, that is a bad. Well, oh good ahead that happens for trying. I don't want harmony. I want harmony. Oh, mamma, mamma! Who give it to him? Who give it to him? Let me in the district -fire-factory that he was nowhere near. It smoldered No, no. There are only ten of us and there ten million fighting somewhere of you, so get your onions up and we will throw up the truce flag. Oh, please let me up. Please shift me. Police are here. Communistic...strike...baloney...honestly this is a habit I get; sometimes I give it and sometimes I don't. Oh, I am all in. That settles it. Are you sure? Please let me get in and eat. Let him harass himself to you and then bother you. Please don't ask me to go there. I don't want to. I still don't want him in the path. It is no use to stage a riot. The sidewalk was in trouble and the bears were in trouble and I broke it up. Please put me in that room. Please keep him in control. My gilt edged stuff and those dirty rats have tuned in. Please mother, don't tear, don't rip; that is something that shouldn't be spoken about. Please get me up, my friends. Please, look out. The shooting is a bit wild, and that kind of shooting saved a man's life. No payrolls. No wells. No coupons. That would be entirely out. Pardon me, I forgot I am plaintiff and not defendant. Look out. Look out for him. Please. He owed me money; he owes everyone money. Why can't he just pullout and give me control? Please, mother, you pick me up now. Please, you know me. No. Don't you scare me. My friends and I think I do a better job. Police are looking for you allover. Be instrumental in letting us know. They are English-men and they are a type I don't know who is best, they or us. Oh, sir, get the doll a roofing. You can play jacks and girls do that with a soft ball and do tricks with it. I take all events into consideration. No. No. And it is no. It is confused and its says no. A boy has never wept nor dashed a thousand kim. Did you hear me? Q. (By Detective) - Who shot you? A.- Two thousand. Come one, get some money in that treasury. We need it. Come on, please get it. I can't tell you to. That is not what you have in the book. Oh, please warden. What am I going to do for money? Please put me up on my feet at once. You are a hard boiled man. Did you hear me? I would hear it, the Circuit Court would hear it, and the Supreme Court might hear it. If that ain't the pay-off. Please crack down on the Chinaman's friends and Hitler's commander. I am sore and I am going up and I am going to give you honey if I can. Mother is the best bet and don't let Satan draw you too fast. Q. (By Detective) - What did the big fellow shoot you for? Q.- You want to get well, don't you? A.- That is what caused the trouble. Look out. Please let me up. If you do this, you can go on and jump right here in the lake. I know who they are. They are French people. All right. Look out, look out. Oh, my memory is gone. A work relief police. Who gets it? I don't know and I don't want to know, but look out. It can be traced. He changed for the worse. Please look out; my fortunes have changed and come back and went back since that. It was desperate. I am wobbly. You ain't got nothing on him but you got it on his helper. Q. (By detective ) - Control yourself. (Statemnt by detective) - No, you are not. At this point, Schultz's wife, Frances, was brought to his bedside. She spoke. (Statement by Mrs. Schultz) - This is Frances. Then pull me out. I am half crazy. They won't let me get up. They dyed my shoes. Open those shoes. Give me something. I am so sick. Give me some water, the only thing that I want. Open this up and break it so I can touch you. Danny, please get me in the car. (Sergeant Conlon questioned Schultz again) - Who shot you? A.- I don't know. I didn't even get a look. I don't know who can have done it. Anybody. Kindly take my shoes off. (He was told that they were off.) No. There is a handcuff on them. The Baron says these things. I know what I am doing here with my collection of papers. It isn't worth a nickel to two guys like you or me but to a collector it is worth a fortune. It is priceless. I am going to turn it over to... Turn you back to me, please Henry. I am so sick now. The police are getting many complaints. Look out. I want that G-note. Look out for Jimmy Valentine for he is an old pal of mine. Come on, come on, Jim. Ok, ok, I am all through. Can't do another thing. Look out mamma, look out for her. You can't beat him. Police, mamma, Helen, mother, please take me out. I will settle the indictment. Come on, open the soap duckets. The chimney sweeps. Talk to the sword. Shut up, you got a big mouth! Please help me up, Henry. Max, come over here. French-Canadian bean soup. I want to pay. Let them leave me alone. Schultz sank into unconsciousness then. It was 6:40 p.m. He died less than two hours later, without saying anything else. After Schultz’s death, it was discovered that he and his "wife" had never gone through an official marriage ceremony and the possible existence of another wife emerged with the discovery of letters and pictures of another woman and children among his effects at the hotel he was staying at in Newark. This was never resolved as his common law wife refused to talk about it and the mystery woman never came forward. Two other women also called at the morgue to receive his effects, but their identities were never established. Though estimated to be worth $7 million when he died, no trace of his income was ever found. By receiving Last Rites (despite his being Jewish), Schultz was guaranteed interment in Gate of Heaven Cemetery in Hawthorne in Westchester County, New York, although at the request of his Orthodox Jewish mother, Schultz’s body was draped with a traditional Jewish prayer shawl, the talit. Several actors have played Dutch Schultz in films: James Remar in "The Cotton Club" (1984), Dustin Hoffman in "Billy Bathgate" (1991), Bruce Nozick in "Hit the Dutchman" (1992), and Tim Roth in "Hoodlum" (1997). Shortly before his death, fearing that he would be incarcerated as a result of Dewey’s efforts, Schultz commissioned the construction of a special airtight, waterproof safe, into which he placed $7 million in cash and bonds. Schultz and Rosencrantz then drove the safe to an undisclosed location somewhere in upstate New York and buried it. At the time of his death, the safe was still interred; as no evidence existed to indicate that either Schultz or Rosencrantz had ever revealed the location of the safe to anyone, the exact place where the safe was buried died with both men. Gangland lore held that Schultz’s enemies — including Lucky Luciano — spent the remainder of their lives searching for the safe. The safe has never been recovered. Annually, treasure hunters meet in the Catskills to search for the safe. One such congregation was documented in the documentary film "Digging for Dutch: The Search for the Lost Treasure of Dutch Schultz." His tombstone lists his real name.